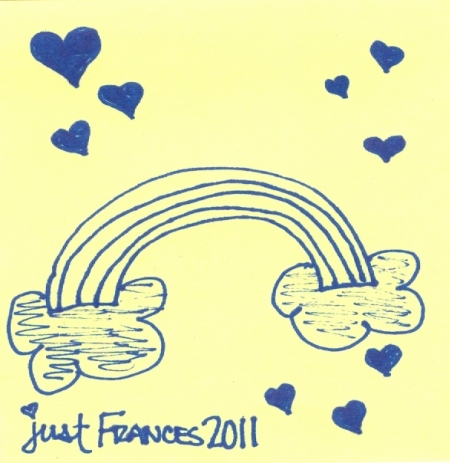 This entry was posted on Tuesday, October 1st, 2013 by Frances Ryan. Today is October 1, which was my target date for beginning my PhD studies. Only I’m not in Scotland at the moment because I’ve not sorted out my visa. It’s a little frustrating, but I have found several silver linings to it all, so that’s OK I suppose. The frustrating bit is that I am still waiting for all of the necessary paperwork just so that I can apply for my visa. Part of that frustration was caused by a wee hiccup nearly three weeks ago, but at least I’m a step closer at the moment. Of course, the most frustrating thing is that it means another (short?) wait until I can begin my PhD studies. But I promised you silver linings, so let’s get to that part of the story! If it weren’t for these minor delays, I would be back in Scotland by now. I would have spent my short time in the States running around like mad trying to see everyone and I would have missed someone. Instead, I’ve been given an extra 3-4 weeks which has meant that I am not rushed and I can actually relax a bit. This delay has meant that I was afforded a nice trip to Olympia and Portland, and has meant that I’ve been able to make plans to see many more friends before I return home. This delay has meant that I have been able to help the folks with a few minor projects around the house (they might not appreciate that, I admit! ), and has meant that I’ve had even more time to just be with Mum and Dad—watching TV, eating dinner, talking about inconsequential things. This delay has meant that I get to spend more time with my nieces and nephews. So yes, this delay has been frustrating. But there have been many, many good things about it, too. Up next in the process: I hope to be applying for my visa soon. Like maybe this week. I hope. And then there will be a bit of waiting anxiously for that to be approved. And then, I will finally be making my way back home to Scotland. But don’t worry—I’ll be sure to let you know when that’s going to happen!